Currently three telecom operators are providing 3G services in Farakka, Murshidabad, West Bengal. These are Vodafone India, Airtel and BSNL. All the operators provide good quality coverage all over Farakka. So I thought of reviewing 3G speeds of these three operators. 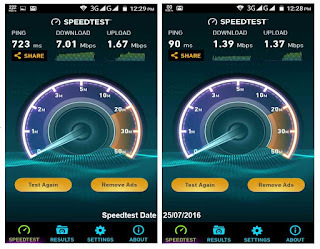 In this first post I'm posting speedtest results of AIRTEL 3G. On my AIRTEL mobile no. I recharged with Rs. 22, which gives 65 MB 3G data with 3 days validity. Here I'm using Micromax MMX377G 3G modem which supports download speeds upto 14.4 Mbps and upload speeds upto 5.76 Mbps. I performed these speedtests in different times of the day to get an overall idea.